Powers/Abilities: Molecule Man could expand his molecular structure so that solid objects passed right through him, and could appear giant-sized in this form. He could condense his molecules, making his body as tough as steel, but reducing his proportions accordingly into two feet in height. He could also dissolve his foes by 'demagnetizing' their molecules. History: (Marvel Vision# 22 (fb))- In 1956, the man who would become Molecule Man suffered an atomic mishap, which granted him amazing abilities. (Marvel Vision# 22 (fb))- Molecule Man's socialism-sniping abilities dotted the world for all of six years. 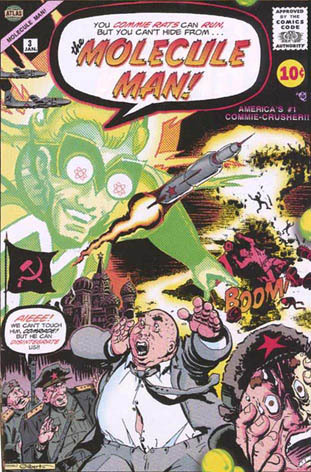 Then, in his final battle with Dread Red the Killer Commie, Molecule Man was skewered on a spear made of cadmium. His ashes blew away in the wind. Molecule Man appeared as part of the "Tmeslip" series, in which contemporary creators imagined themselves collaborating with Stan Lee at the dawn of the age of Marvel Comics (or in this case, Atlas Comics). These pastiches appeared in Marvel Vision, the publisher's in-house magazine. It is unclear whether Molecule Man could be said to have existed on Earth-616. If he did not, he is likely an alternate counterpart to Molecule Man (Owen Reece). If he did, his secret identity remains unknown. Michael T. Gilbert comments, "I came up with the origin, though I believe Marvel added the last paragraph with the details of his death." All other characters mentioned or pictured are � and 1941-2099 Marvel Characters, Inc. All Rights Reserved. If you like this stuff, you should check out the real thing!